America’s Democratic Party, environmental groups and clean-energy leaders pushing action on climate change are at odds over how best to address it. Why it matters: Conflict is erupting over the best technologies and messaging, and experts worry the fighting could stifle progress toward the big thing they agree on: the need to address climate change. The divisions, brewing for years, are escalating in the face of a Republican-run government that doesn’t recognize the issue at all. The main flashpoint: how large a role renewable energy should play in America’s future energy mix, compared to other low-carbon resources not as politically popular but that most experts say are needed to cut greenhouse gas emissions in cost-effective ways. Natural gas and coal power almost two-thirds of U.S. electricity. Nearly 15% is from renewables: half each from hydropower and wind, less than 1% from solar. 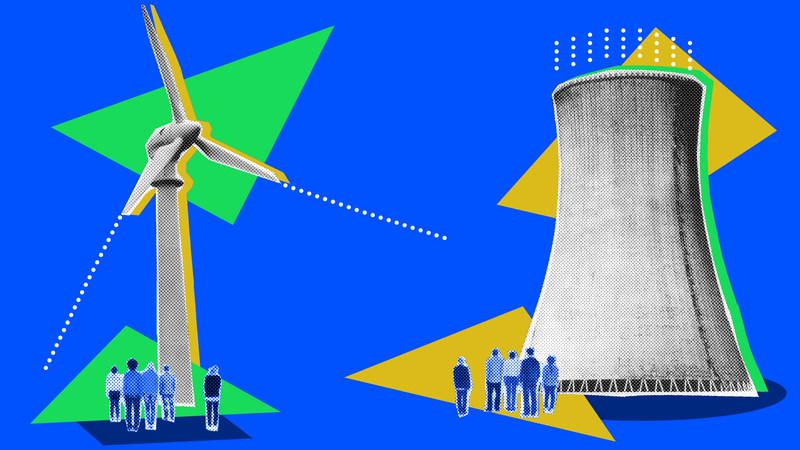 Nuclear power provides 60% of carbon-free electricity in the U.S.
America’s transportation and industrial sectors are overwhelmingly dependent upon fossil fuels. The environmental groups 350.org and Sierra Club. Some progressive lawmakers at the federal level, led by Sens. Bernie Sanders and Jeff Merkley. Actors Leonardo DiCaprio and Mark Ruffalo. Stanford University professor Mark Jacobson, who has published controversial studies — one just last week — finding economies that run 100% on renewable energy in the U.S. and around the world are possible by 2050. Beyond that faction, positions are not as clearly defined or vocal, but the shared theme supports a broader mix of low-carbon technologies cutting greenhouse gas emissions. This includes big increases in wind and solar but also nuclear power and technology capturing carbon emissions from fossil fuels. Natural gas, which burns 50% less carbon emissions than coal, is also considered an inevitable temporary step away from coal to renewables. This view comes amid growing criticism about emissions of methane, a potent greenhouse gas that's the main component of gas, and the Trump administration's regulatory rollback of methane rules. Former Obama administration officials, including former Energy Secretary Ernest Moniz. National Democratic politicians, including Sens. Sheldon Whitehouse of Rhode Island and Brian Schatz of Hawaii, and former Virginia Governor Terry McAuliffe. Some labor unions, and centrist environmental groups (Clean Air Task Force) and think tanks (The Breakthrough Institute and Third Way). For these people and groups, the urgent threat of climate change necessitates pragmatism and possibly compromise with conservatives supporting climate action. In response, 350.org founder Bill McKibben told me: “Terry McAuliffe's claims are simply sad,” reiterating his opposition to natural gas. Brad Markell, executive director of the AFL-CIO’s Industrial Union Council: "The concern is whether an approach to fighting climate change centered on blocking infrastructure projects like pipelines is so politically divisive that it ultimately slows down progress on climate." “They should realize they are beating dead horses and start getting on board and help solve the problem instead of being obstacles to the problem,” Jacobson told me. Last November he filed a lawsuit against Christopher Clack, lead author of a report disputing one of Jacobson's studies, and the National Academy of Sciences that published Clack’s report. Political momentum is growing for a renewables-only agenda, fueled by plummeting prices for wind and solar. The number of corporations committing to 100% renewable energy has nearly tripled to 100 since 2015. Democratic political candidates are touting the line, and the bipartisan Conference of Mayors endorsed the concept last year. Jesse Jenkins, an energy analyst getting his Ph.D at the Massachusetts Institute for Technology, who backs a more diverse low-carbon approach, said such details shouldn’t be glossed over.